VR has quickly become one of the most exciting new technologies around, especially for the PC industry. Although we’re still a ways from the Holodeck, the experiences available today will recalibrate your expectations for immersion. Sure, you know you’re not really blasting swarms of enemy drones in a futuristic spaceport, taking in the view from the summit of Mount Everest, or rearranging furniture in the seaside abode of your dreams. 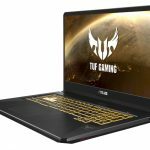 But the combination of slick graphics, intuitive interaction, and fluid motion tracking blurs the line just enough to forget everything outside your new digital existence. While initial virtual reality solutions for the PC have been transformative, their realities have also been complicated. The required external sensors complicate setup, and steep system requirements shut out machines that lack serious horsepower. Being strapped in for prolonged periods is also no picnic, often leading to fatigue and a flush VR face that hamper how long you can sustain your escape from the real world. 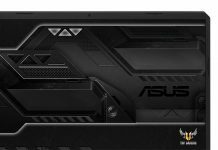 We addressed these flaws by designing the ASUS HC102 Windows Mixed Reality Headset to simplify VR for a wide audience. 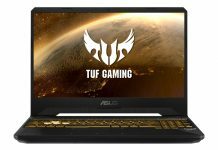 It turns tracking inside out to reduce setup time to minutes and loosens hardware restrictions to let even conventional laptops get in on the action. More importantly, the lightweight headset is tailored for comfort, allowing you to explore virtual realms for hours on end. As amazing as virtual reality is inside the goggles, your resulting expression of slack-jawed wonder inevitably looks a bit silly to everyone on the outside. We’d rather not dial down the awe that produces this less-than-attractive gape, so we made the headset distinctive enough to distract observers. The visor is covered by an abstract polygon landscape that fades away at the edges, echoing the divide between real and virtual worlds. 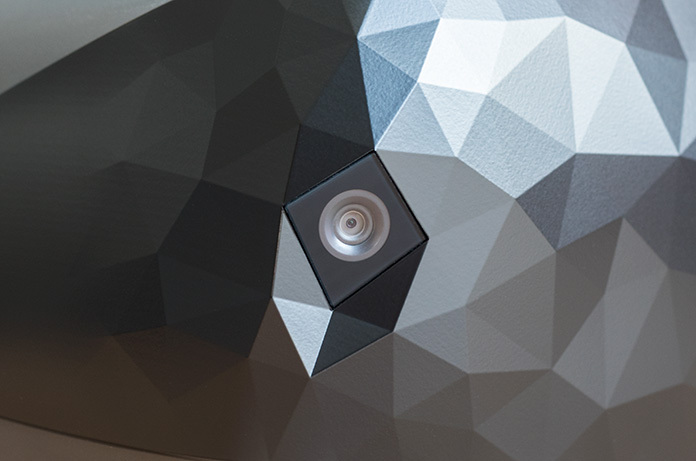 Our designers created this pattern using digital architecture techniques and honed it with 3D-printed prototypes, resulting in a headset that looks as futuristic as the experience it provides. VR headgear inevitably adds weight that can make longer sessions draining, even for seated experiences that don’t have you flailing around with your body. At 400 g, the HC102 headset is noticeably lighter than the competition, in some cases by a lot; the Oculus Rift tips the scales at 470 g, while the HTC Vive weighs 555 g, and the PlayStation VR balloons to 610 g.
The HC102’s minimal weight is well balanced between your forehead and the back of your skull, so the headset sits securely with only light tension on the band that wraps around your head. Twisting the dial at the back cinches the strap in notched increments that customize the fit in seconds. Adjustments can easily be made with one hand, which is especially helpful when you’ve got the requisite motion controllers hanging from each wrist. Cushioning at the front and back of the band cradles your head comfortably even if you prefer to be strapped in tightly. Our designers experimented with different foam shapes and densities to find the best fit. 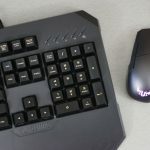 They also focused on the fabric covering the pads, selecting a microfiber material that feels soft on your skin but incorporates grippy silicone rubber to prevent slippage. The material is cool to the touch, which helps reduce perspiration, and its combination of antibacterial and quick-drying properties help prevent the pads from getting funky. 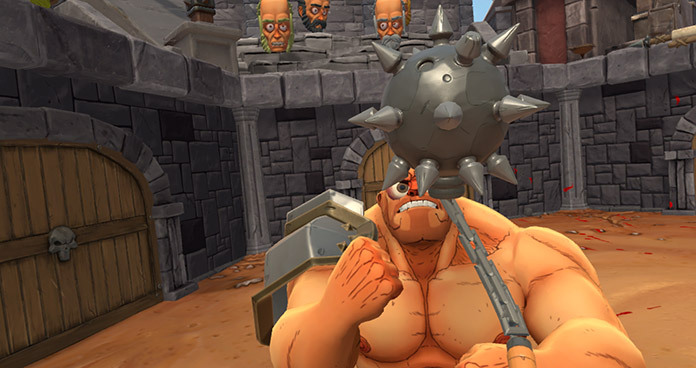 Some sweating is inevitable in more active games, like Sparc‘s stylized sportsball duels and Gorn‘s cartoonishly violent gladiator battles, but the cushioning is secured with hook-and-loop strips, so it conveniently peels off for cleaning. 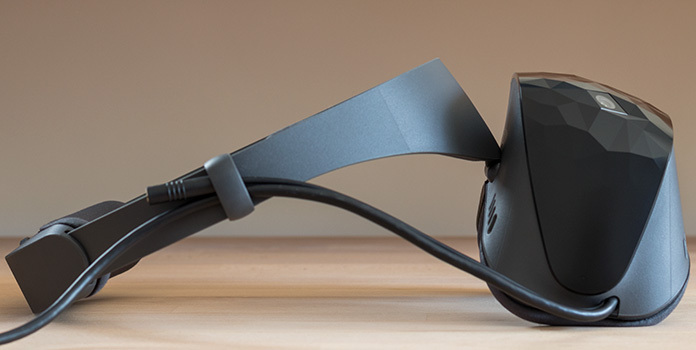 Unlike the Rift and Vive, which stay attached largely by squishing their goggles into your face, the HC102 suspends the display from the front of the headband. The visor hangs flush without pressing against the area around your eyes, which relieves much of the pressure and heat that makes longer adventures uncomfortable. It also sits on a hinge that allows the goggles to be flipped up in an instant, without removing the rest of the headset. 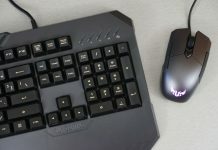 This subtle feature is great for taking quick breaks mid-session, whether it’s to untangle the tether from your feet, type something at the keyboard, or simply catch your breath after an especially intense moment. And getting suited up is much simpler when you can see; you can dial-in the band, don headphones, and strap the controllers to your wrists before lowering the display to complete your plunge into VR. 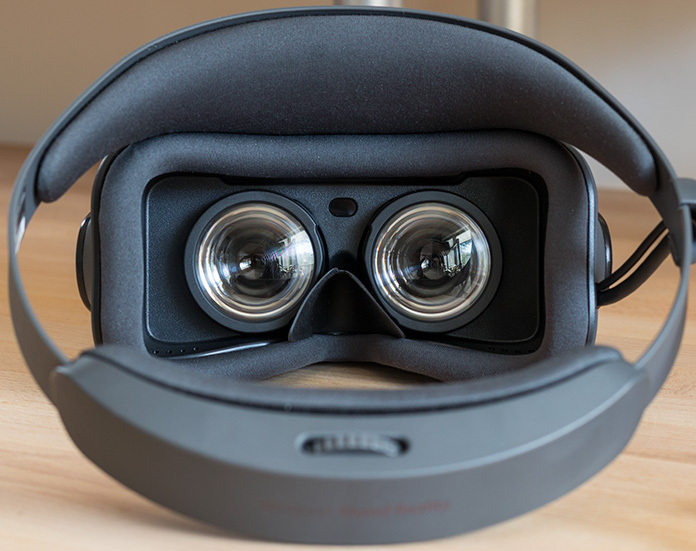 After flipping down the goggles, you’re greeted by a digital world drawn at a much higher resolution than what’s available in typical VR headsets. The HC102 pumps out 1440×1440 per eye, or 2880×1440 combined, which is 60% more pixels than the Oculus Rift and HTC Vive, and double what you get from the PlayStation VR headset. More megapixels make a big difference in VR, where the screen is right in front of your eyes, and the HC102 plainly illustrates why. 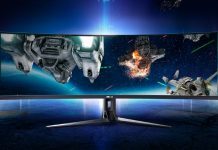 Its LTPS LCD produces a sharp picture with less of the “screen-door effect” that makes lower-res VR headsets look pixelated. The subtler pixel boundaries impart a seamlessness that’s particularly apparent with solid textures like the stark backdrop for SUPERHOT‘s slow-motion gunplay, the seemingly endless sea surrounding you in theBlu, and the music-fueled orbs advancing upon you in Audiosurf. At the same time, the higher resolution makes details look sharper, which is especially noticeable with all forms of text, from in-game menus and HUDs to web pages in Microsoft’s virtual Edge browser. Movement and animation are smooth inside the HC102 thanks to the display’s 90Hz refresh rate, which is the same as on other contemporary headsets. The backlight strobes with each refresh, turning on long enough to illuminate the new frame before going dark again to minimize ghosting and blurring. The combination of high refresh and low persistence is key to avoiding the motion sickness some people experience in VR. Responsive motion tracking is also extremely important for preventing disorienting discomfort in virtual reality. A simulated world can look as lifelike as you want, but the illusion falls apart if you shift your head to look around at all the awesome, and the view fails to fluidly follow your gaze. Even a slight delay between real-world movements and their virtual manifestations can ruin the moment and remind you that you’re not really there, sometimes with nauseating results. To avoid this, VR solutions for the PC have traditionally tracked headset and controller movement using external sensors arranged around the boundaries of the play area. External sensors take longer to set up, which can be especially annoying when moving your rig around, and you have to find space for them, which can be difficult in smaller rooms and apartments. Fortunately, the HC102’s inside-out tracking achieves the responsiveness and precision vital for VR without relying on cumbersome external sensors. Instead, the headset integrates sensors that monitor the world around you, reducing the complexity of the system. The inside-out tracking offers six degrees of freedom, just like typical outside-in setups. Dual black-and-white cameras embedded in the left and right edges of the visor watch your surroundings in real time, and their feeds combine with data from an internal gyroscope, accelerometer, and magnetometer to map the precise position and orientation of your head in virtual space. Camera-based tracking extends to the wireless motion controllers, which are covered with 32 LEDs each for maximum visibility. The controllers add tremendously to the experience compared to a standard gamepad, especially in titles that have been built from the ground up for VR. Seeing physical movements reflected in virtual reality heightens your sense of presence and opens up exciting possibilities for gameplay and even basic interaction. Each controller has the triggers required for most interactions, from blasting through waves of enemies in the retro-shooter world of Serious Sam to drawing virtual masterpieces in the creative playground that is Tilt Brush. 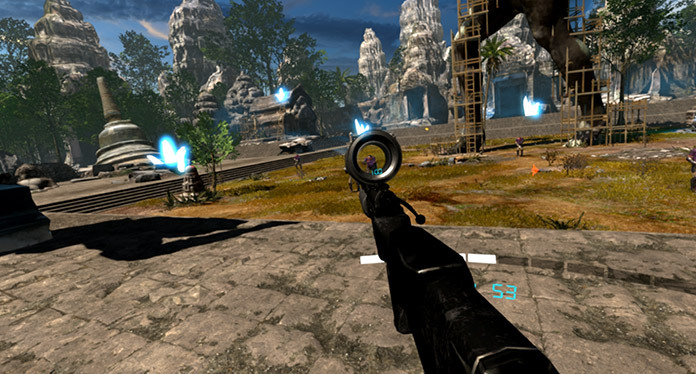 Grip buttons positioned under your middle fingers are typically used to pick up items, which adds a level of realism that makes you squeeze for dear life in games like Raw Data, where inadvertently dropping your weapons leaves you momentarily defenseless against a robot army with no sense of sportsmanship. 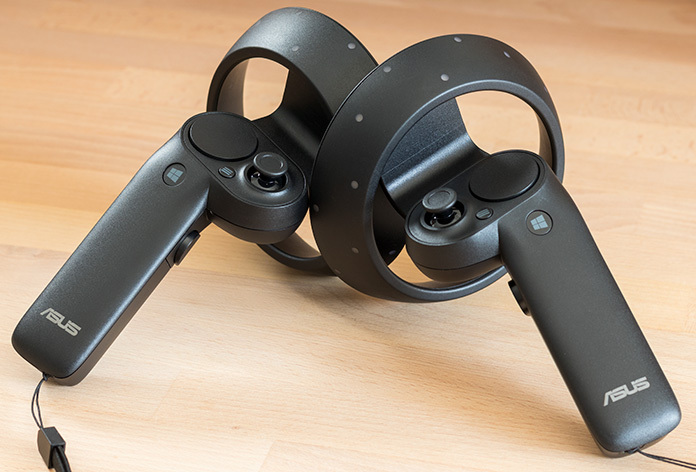 A circular touchpad and analog stick are accessible to your thumbs, providing a broader range of input options than conventional VR controllers. These are typically used for navigation, like dashing or teleporting around virtual environments so you don’t end up walking into your walls. 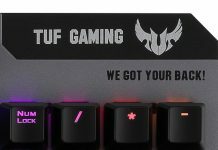 Two additional buttons are easily reached with your thumbs and effectively offer the time-honored gamepad functions of select and start. It takes about ten minutes to go from unboxing to fully situated in virtual reality, most of which is spent waiting for software to download. First, make sure you’re running Windows 10 version 1709 or later; the most recent versions of the OS detect the headset and install the appropriate drivers automatically. Once you’re up to date, plug in and let Windows guide you through the rest of the process, including pairing the controllers and tracing your play area. That’s it! 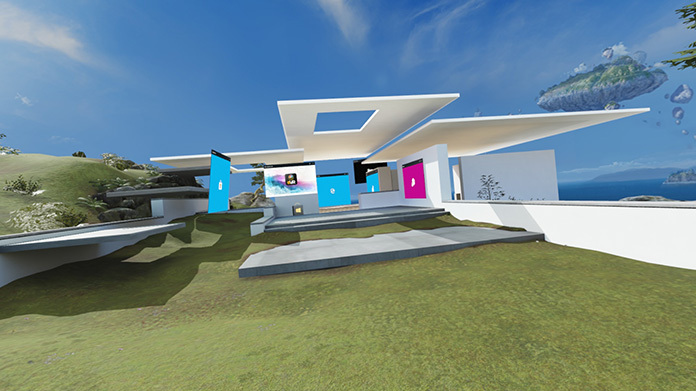 After the Windows Mixed Reality platform is configured, redefining your play area to fit a new environment takes hardly any time at all. That’s really helpful when demoing VR on the road, even if it’s just going to a friend’s place for an evening of whiskey-fueled competition for high scores and bragging rights. Or so I’ve heard. Let’s just say a backpack can hold everything required for such an event, including a gaming laptop and appropriate libations. 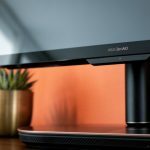 With only solo USB and HDMI cables to connect, is easy to pair with desktops and laptops alike. You do have to bring your own headphones, though. The integrated 3.5-mm audio jack works with a broad range of options, from in-ear buds to over-ear headsets, so you can pick the right pair for the moment. Sealed cans are especially immersive, but they can almost be too isolating sometimes, so it’s nice to have the flexibility to change things up as needed. Windows Mixed Reality is Microsoft’s platform for a range of devices that includes not only VR headsets, but also augmented-reality devices like the HoloLens. 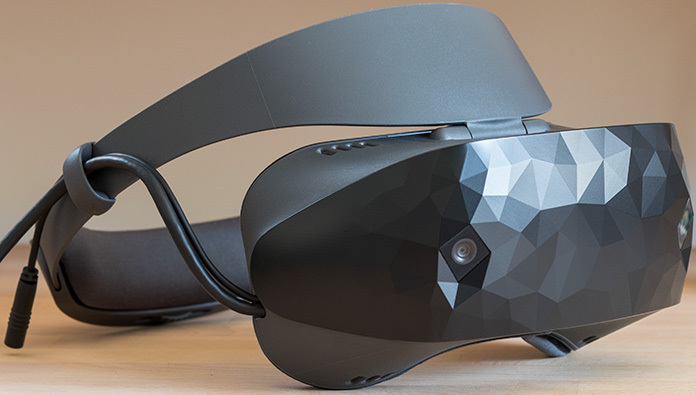 While the HC102 is technically a Windows Mixed Reality Headset, the only reality it offers is virtual. Implementing VR through Microsoft’s framework has some advantages, including much lower baseline system requirements than the Rift and Vive. 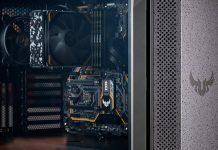 Those platforms demand at least a recent mid-range graphics card or discrete GPU, but Windows MR can get by on the HD Graphics 620 engine integrated into recent Intel CPUs, which allows a much broader range of PCs to participate. Meeting the entry-level requirements only guarantees a 60Hz experience, which is OK for 360° videos and some basic exploration but definitely not ideal for satisfying gameplay. For the full VR experience, we recommend meeting the “Ultra PC” requirements for 90Hz operation, which are only slightly below the minimum specs from Oculus and HTC. 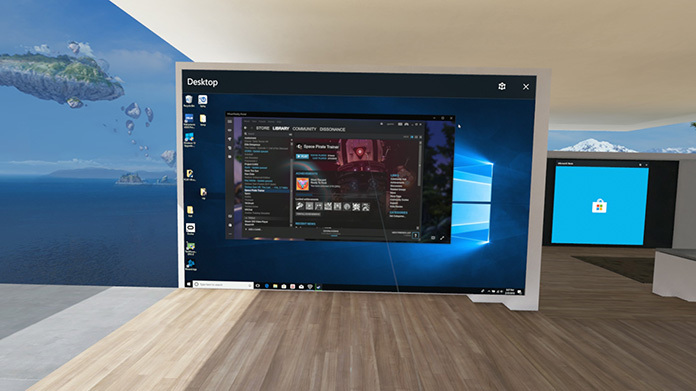 Another benefit of Windows Mixed Reality is the virtual environment it creates within the OS. Full disclosure: I didn’t expect to spend a lot of time in the cliff-side home that serves as a portal to different games and experiences. But here I am, writing parts of this article using Google Docs in a giant Edge browser that’s suspended on my balcony. Waves gently splash into the shoreline below, while gulls call in the distance. Another Edge window hangs to the right, displaying a second document filled with my notes, and off to the side there’s a floating calculator from when I was working out megapixel math. It’s a bizarre scene, but I feel calmer and more focused than I was earlier, while writing at my usual desk in meatspace, and I’m eager to experiment more with this virtual approach to productivity. The Cliff House has a fixed floor plan, complete with a subterranean theater that’s already set up for viewing immersive videos, but the furniture and decor are customizable throughout. You can populate the space with 3D objects, otherwise known as holograms, and hang applications on the walls or in mid-air. 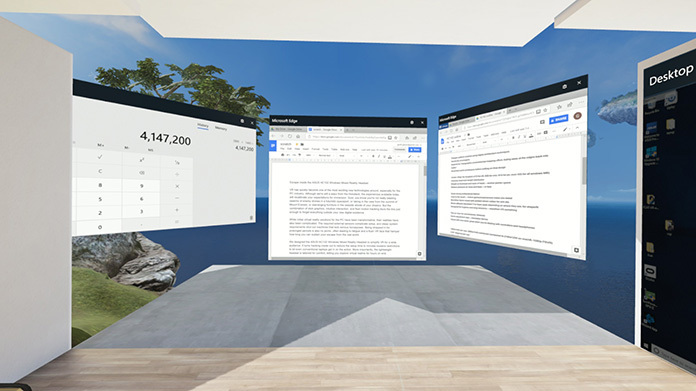 Most of the apps available through the Microsoft Store are confined to windows suspended in space, which is very cool but not exactly a true VR experience. However, you can also get apps like NBC Sports VR, which currently takes you inside the Pyeongchang Olympics with 360° and 180° videos from a wide selection of events. 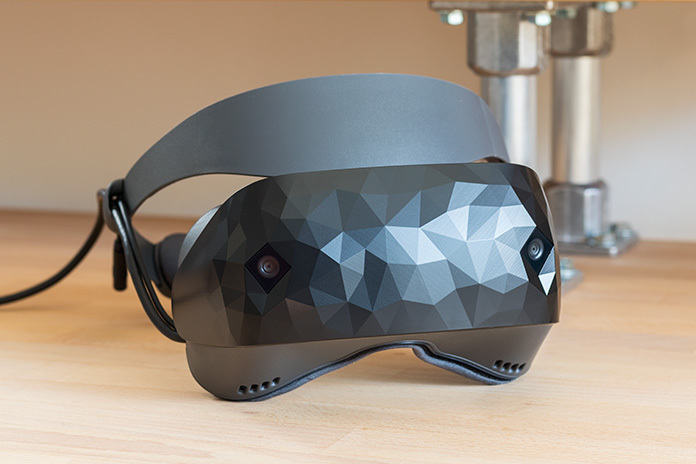 Mixed Reality experiences have their own section in the Microsoft store, so it’s easy to find apps that take full advantage of the HC102. Although there is loads of VR content on the Microsoft Store, Windows Mixed Reality devices are also compatible with Steam, which has its own collection of virtual reality experiences. Launching SteamVR games is incredibly easy. First, install SteamVR and its Windows Mixed Reality client. Then call up a desktop Window from the Cliff House, open Steam, and then launch whatever you want to play. Once in-game, you can open the SteamVR interface by clicking the thumbstick on the left controller, or return to Microsoft’s virtual home with the Windows button on either one. Most of my testing with the HC102 has involved bouncing between different SteamVR titles, often for several hours in a stretch. It’s amazing how quickly time slips away when you can completely immerse yourself in another world, especially if you’re never satisfied with your score in Space Pirate Trainer. Getting sucked into playing “just one more round” of the addictive arcade shooter is definitely easier with such a comfortable headset, at least compared to the Oculus Rift and HTC Vive that are usually strapped to my head. Those two are somewhat self-limiting because, sooner rather than later, I need a break from the heat and pressure of their goggles against my face. To be fair, I’m still the bottleneck for time spent in VR. While the HC102’s lightweight headset reduces the strain on my neck, there’s little it can do to temper the fatigue that builds up in my arms after spirited skull-bashing in Gorn. Sparc‘s engaging combination of handball, tennis, and Tron is basically a virtual sport, complete with players panting audibly in online matches. And even the simple act of holding your arms out, guns blazing in a shooter, can feel like a workout. I’m increasingly drawn to active games that increase my heart rate, making the HC102’s sweat-friendly padding a more valuable feature than I initially expected. The hinged visor was another surprise; it’s really handy when switching between games that use the motion controllers and those that prefer a more conventional gamepad. With the screen out of the way, I can even set up a wheel and pedals to take driving sims to the next level. While VR is generally most immersive with room-scale experiences that take advantage of the motion controllers and encourage you to move around in virtual space, I’m amazed at how intense Project Cars feels for something that keeps me seated and mostly staring straight ahead. Project Cars is one of the most graphically impressive games around, both inside and out of VR, so it’s a good match for the headset’s high-resolution display. But to be honest, I’m even more impressed by what the upgraded screen does for cartoonish visuals that bear little resemblance to real life. Minecraft‘s blocky landscapes are about as far from the uncanny valley as you can get, yet they’re presented with a clarity that helps suspend disbelief. 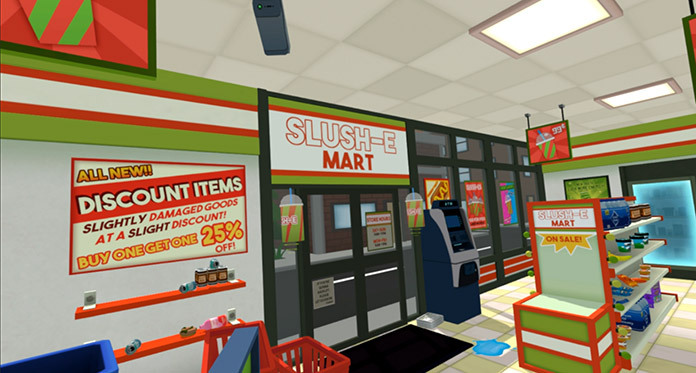 The same goes for Job Simulator‘s convenience store, which feels a little bit like being inside The Simpsons. We all want to escape the reality around us. Even at the best of times, our day-to-day lives are considerably more ordinary than the exotic environments and compelling interaction we can simulate. 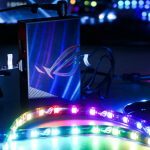 VR has long promised a more satisfying way to sate our thirst for virtual experiences, and the ASUS HC102 Windows Mixed Reality Headset makes that exciting future accessible today. 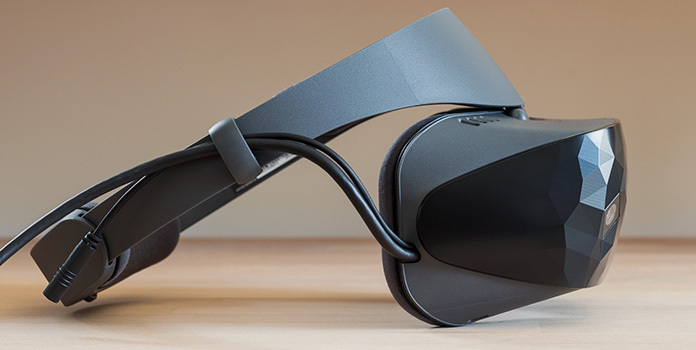 The HC102 gets you into VR faster and helps you stay there longer. 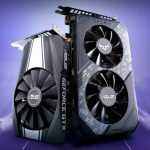 Its lower system requirements and simplified setup make virtual reality more approachable, and its light weight and cushy design enable extended trips in greater comfort. You don’t have to be a gamer, either. Between videos and other forms of entertainment, plus intriguing potential for productivity and even fitness, there’s something for virtually everyone. Get the ASUS HC102 Windows Mixed Reality Headset today for $429 USD from the retailers listed in the table above.